Lovely picture on the front page of yesterday’s edition of the Sunday Samoan, showing fruit vendor Ronnie Malaki standing behind his fruits with a perplexed look. Perhaps wondering when his next customer will show, and already worried at the implications of returning home to his family without selling any of his fruits. A lot of people can fit into Ronnie’s shoes too, knowing challenging it is becoming to sell fruits and vegetables, in Apia’s main markets. Last week the Samoa Observer ran a story on market vendors lamenting the lack of customers at the Fugalei market. Fruit vendor Lomeo Seva was shocked his customers have suddenly vanished. 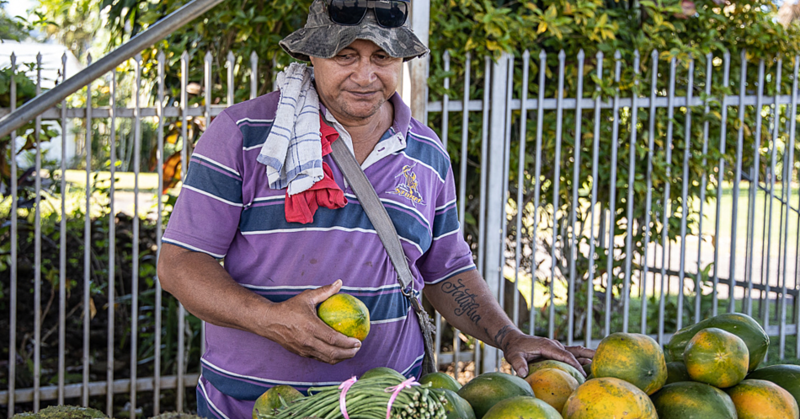 But yesterday’s story puts the issue in perspective – the increasing cost of vegetables at markets in Apia and elsewhere is driving customers away. A survey of the markets and the different prices charged by the vendors by this newspaper’s senior reporter, Lanuola Tusani Tupufia - Ah Tong, points to the rising cost of vegetables at markets in recent weeks. Take for example in early February, you can find locally grown vegetables such as Chinese cabbage for $3.00 tala a bundle, cucumber and tomato packet for $6 tala and a medium sized pumpkin for $7.00 tala. The prices vary between supermarkets and roadside markets but the difference was a couple of cents. Fast forward a month later, the cost for those locally grown produces has doubled and tripled. Another walk in the supermarkets’ you will find the cost of Chinese cabbage has increased to $8 tala per kilo, pumpkin is $5 tala per kilo, and a bag of cucumber is $10 tala. Step outside where the smaller markets are; cost of Chinese cabbages range from $5tala to $7tala a bundle, $12tala for a medium size pumpkin and $8tala for cucumbers. There is no doubt that the cost of living in Apia and Samoa generally is rising, consequently, the spike in the cost of goods and services. And this trend doesn’t augur well for a country battling a noncommunicable disease (NCD) epidemic. Medical professionals including the Government sing praises of the role that a healthy diet can play in fighting against NCDs such as most heart diseases, cancers, diabetes and chronic kidney disease amongst others. But sadly the average cost of a healthy diet in Samoa – comprising fruits, vegetables and seafood – is going beyond the means of ordinary families, and opening the doors of their vulnerability to diseases such as NCDs. But we cannot blame fruit vendors and farmers such as Ronnie for the spike in their prices, as they would most probably be passing on the rising cost of expenses that they have to meet as a farmer. These could include the cost of transport their vegetables and fruits to the market. It is likely most of them are making a loss, spending close to $100 to bring their produce to the markets, only to make less than $50 at the end of the day. So is it possible to kill two birds with one stone by ensuring families have access to affordable fruits and vegetables, and farmers are in a position to at least make a small profit from their hard day’s work? Nothing is impossible and going down the path of subsidizing food systems to ensure only the nutritious, safe and affordable fruits are available to everyone is one option. These could be done by improving transport infrastructure for farmers, to ensure their expenses associated with moving their produce gradually decreases, thus enabling them to offer competitive and affordable prices to families. There is also the option of enacting GST legislation that would ensure all local produce, which are sold in the various supermarkets and stores, are tax-free and thus available to everyone. What do you think? Have a wonderful Monday Samoa and God bless.